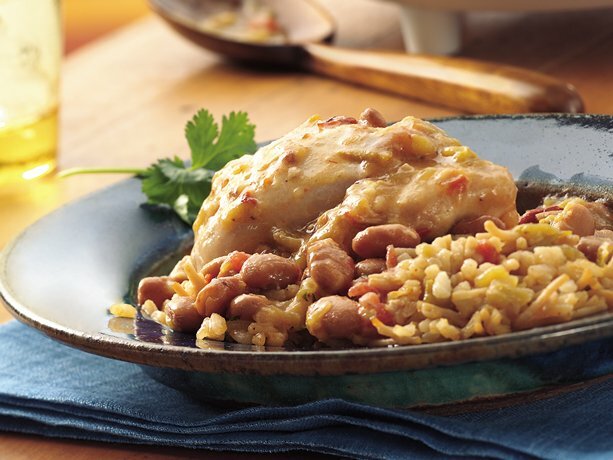 Place chicken, pinto beans, green chiles, chipotle chiles and gravy mix (dry) in order listed in 3- to 3 1/2-quart slow cooker. About 30 minutes before serving, make Spanish rice mix as directed on package, using water and oil. Meanwhile, gently stir tomato into chicken mixture. To serve, spoon about 1 1/4 cups chicken mixture over 1/2 cup rice. Sprinkle with cilantro. Good one sharing , looks good.